Kaua’i resident Michael DeMotta articulates the need for restoration on Lehua Island, Hawai’i. Offshore islets surrounding the main Hawaiian Islands are sanctuaries for many native species. Often, they are insulated against the influences that have caused native coastal ecosystems to collapse on the main islands. The harshness of the windswept and salty environments have allowed the well-adapted plants and animals to retain their place in the ecosystem. When aggressive non-native (invasive) species are introduced, the native ecosystem declines. Most people are familiar with the ahupuaa system of land management. A healthy watershed, and sustainable practices throughout the ahupuaa, ensure a healthy reef system and the surrounding ocean and fisheries remain healthy. This system also applies to the small offshore islets. A healthy upland ecosystem, though smaller than a main island, will ensure a healthy reef and ocean ecosystem. There are springs and seeps on Lehua. These fresh water sources might dry up if a functioning native ecosystem isn’t reestablished on land. Lehua Islands’ upland ecosystem has been degrading steadily since the introduction of invasive species like rats and rabbits. However, native coastal plants are resilient, and the native seed bank remains viable. Since the removal of rabbits, native ilima has recovered all over the island. But invasive rats persist, eating native plants and seeds, in addition to seabird eggs and chicks. 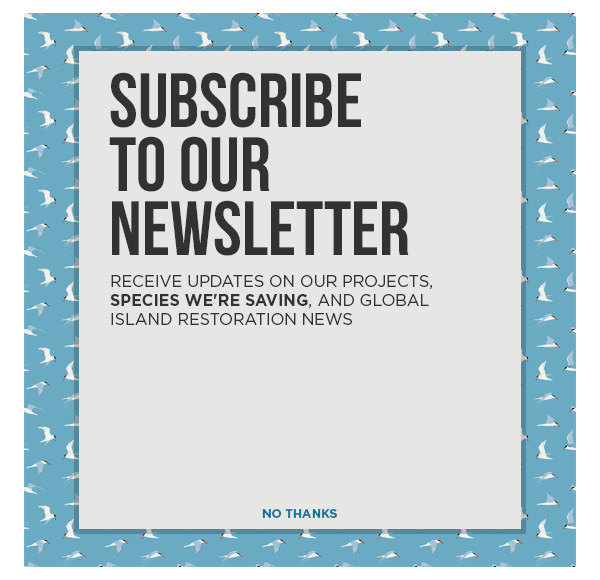 My interest in continuing our native plant restoration work at Lehua Island is bringing back a viable and functioning ecosystem that will provide habitat for seabirds and native insects. Uninhabited offshore islands are unique in that there is no disturbance from the domestic animals like cats, pigs and goats. Once a native plant species is reintroduced, it will thrive and become fertile, dropping seeds that will help to revegetate the island. Most of the plants that will be used for restoration are deep rooted woody flowering species that can compete and suppress the non-native grassy weeds that dominate the Lehua landscape. Our limited restoration work has already proven this. Expanded restoration efforts require an island free from invasive foragers. My other interest in seeing Lehua fully restored with native plants is the possibility of Lehua becoming a refuge for native birds, insects and other plants that will potentially lose their homes if sea levels continue to rise. Many of the northwest Hawaiian islands are low coral atolls that could be completely overrun if the ocean levels rise high enough. The tsunami of 2011 killed an estimated 110,000 albatross chicks and about 2,000 adult albatross. The displacement of albatross, along with many other species that use the northwest Hawaiian islands for nesting, would devastate native seabird populations. In addition to this, there are Laysan Teal, the Laysan finch and other land animals that would have no way of getting off the island should those islands submerge into a rising ocean. The work we do now on Lehua, and other high volcanic islands in the Hawaiian chain, will prove vital in saving these unique Hawaiian species.